The Grill on the Alley was opened in 1984 as a living tribute to the great American grills of yesterday. 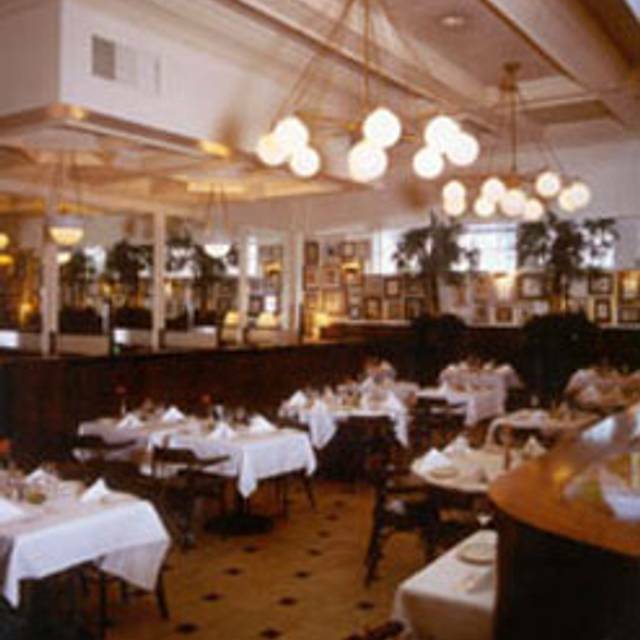 In time, it has established itself as one of the country's leading restaurants, praised by writers across the country. The menu is classic American grill - prime steaks, fresh seafood, traditional dishes such as chicken pot pie or meatloaf and mashed potatoes, and homemade desserts. 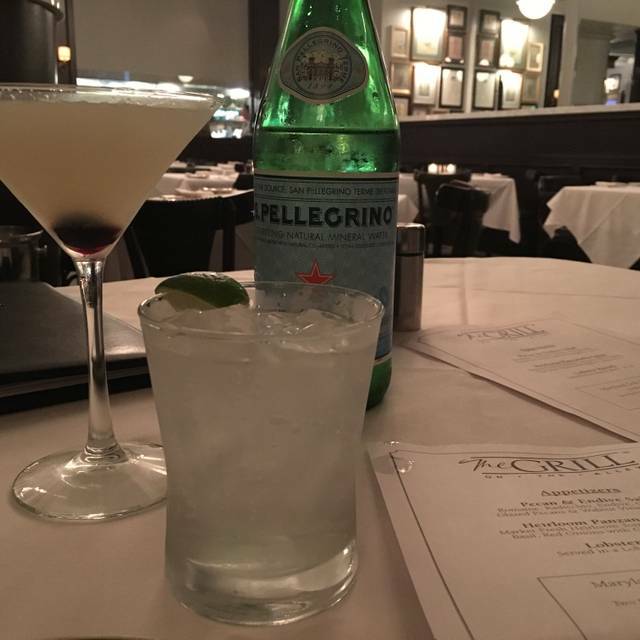 Named to The Fine Dining Hall of Fame by Nation's Restaurant News, The Grill is home of the entertainment industry's "power lunch," but is also open for dinner seven days a week. Our server was amazing and very knowledgeable. We love coming here! Great food and great service by Jane! Poached salmon salad best in LA. You can actually have a conversation without shouting. Excellent service. The Grill is ALWAYS great...an LA institution. Great food and amazing service - as always. Compared to most comparably-priced steakhouses, we found this restaurant to be mediocre. The food was bland, there were no bone-in selections and the wine list very limited. Generally past it’s prime and we would not return. Great service and flexibility with meal. Treated wonderfully from arrival and through the meal. Very accommodating. Res. honored. Great servers. Bread good. Salads good. Steak & brick chicken good. Steak house prices as expected. Great evening out! Excellent food and service. Would definitely have dinner there again! I love this place. But sometimes things just don’t go well. Ordered surf & turf. The surf was great, but the turf was was way over cooked. Asked for pink, got brown. And then of course their is the wait when u send back. My friend ordered a rib eye. Very fatty and tough and raw. They were very gracious about taking care of it all. But it still is a shame. But I would still go back for another try. Love this place. Love the place. Great food and staff. Always a good experience. Mother’s 92 birthday. Everything was was really warm & wonderful. That is why it was her #1 choice for this family celebration. Thank you management, serving staff & kitchen/ chef professionals. And Mother Nature for a beautiful BH afternoon ! I love The Grill. Everyone has an off day. Our order took a bit longer to be served. We had 2 waiters. Both were professional throughout our experience. My order was wrong. Our waiter was willing to take it back. However, sending it back that evening felt like it could take a longer time. I didn’t enjoy my fish. I couldn’t eat it. Additionally, the waiter thought our food was delivered when it was not. Just an off evening. Everything was wonderful EXCEPT the darkness . Almost impossible to discern the bill, add the tip and sign. How about a little more light. In L.A. for a few days of art and theater, my teenage son and I needed a place for an early dinner before a show at the Wallis. Everything about Grill on the Alley was right for us, from availability at 6:15 (even arriving a few minutes early), to the service, to the food. Service from the maitre d' and our wait staff was attentive and quick, and they were happy to make sure we enjoyed our meal, but with enough time to get to the theater. Classic Caesar salad was just as it should be, and we split a New York strip that was perfectly charred and medium rare, along with some onion rings and glass of Cab. The atmosphere (maybe especially because it was early) was definitely local, upscale, and not at all stuffy. Sauce Bernaise didn't arrive, but it wasn't actually missed, and our server took it off the tab in record time. It would have been nice to linger over a properly long meal, and next time we're in BH we'll make sure we plan for that. This is the second consecutive visit where the meat I ordered was excessively tough. My previous visit I ordered the rib eye steak and it was so tough I actually couldn’t eat it. This time I ordered the prime rib which was bearly chewable with excessive waiste. Not a good trend. Always good. Ready to accomodate any and all requests. Reservation changes accepted in good spirit without a lot of phony commnents. Best chicken pot pie around, everything is always top notch. Thanks to everyone for great service! Very noisy on Saturday evening and they asked us to leave at 7 pm. Our dinner reservation was 5:45 pm and we only stayed around 1 hr 15 mins. Usually I want to eat about 2 hours in relaxed & casual mood. We love The Grill...our favorite restaurant in BH! Consistency is always an essential ingredient for a successful restaurant. The Grill has always been consistently excellent in food quality and preparation and in service. We will return when we have the opportunity. Service was somewhat slow. Food was great. Great meal and one of Beverly Hill’s legendary restaurants. The very day I completed a great review of this venue...one of many over the years...we visited again. This time the whole night was really bad: the host, who is usually pretty good, was flustered, rude and hurried, trying to hustle us to a table of 2 for a party of four (and a horrible two top to boot). Clearly he had not even looked at our reservation before trying to seat us. After I had requested a booth, he seated us at a table In the middle, next to a large party with several small children ( who fortunately were very well behaved). Our server was slow to arrive, was nothing like other servers we have experienced here. Again, very rushed and disorganized, telling us he had a “helper” several times, but we never saw that person and waited quite a while to even get a drink order taken. Food was good, as usual, but it took a long time to be served. The person clearing the table spilled a server full of salad dressing all over the table in front of me, and never even noticed. However, our server did come over and cover the area with a napkin fairly quickly. Everybody has a bad day, but this was definitely not the service or experience we have been used to over the years. I am afraid our guests will never return. Bad service sets the mood for a bad evening. This is one of the best meals in the LA county area. An amazing food yet a great company. I would highly recommend this location for any special events or birthday 🎂 . Had a reservation for 8:15, my finances birthday, well 8:45 rolled around and we were still not seated, finally around 8:55 we were sat. I asked in advance through Open Tale for a booth but were sat at a table. Rocky start, but you ask why I would recommend this place and give it 4 stars across the board. Well, about 5 minutes went by and we ordered our drinks, the the host walked up and without saying anything apologized and moved us to a booth that a couple had left empty, saying they were busy and wanted to acknowledge my requests for my girls birthday. I didn't say anything because I knew they were busy. Then the food started coming out, the Wedge Salad was perfect and a large portion, the Lobster mashed potatoes were just about the best I ever had and I mean ever. The filet was cooked perfectly, the only reason why I gave it a 4 out of 5, although very tasty the mesquite was a little heavy for me. They quietly sang her "happy birthday" and gave us there Dolce De Leche cake and me and the future wife agreed, it was not only one of the best Dolce cakes we had, it was one of the best cakes ever. Hosts we’re inattentive. Waiters were great. Loved Date Night at the Alley! Love the old school feel, and the food is on point!! It was refreshing to see many young people here too. It’s a must experience restaurant in BH. Food is always good, and front desk is handled very professionally and efficiently. A favorite place for us. Energetic, but not oppressive,bar. Full food service at bar. It’s become so busy that there are reservations at the bar as well at busy times. It was Valentine’s Day so very busy and very noisy. Usually the ambience is more quiet and refined. Nice atmosphere for a business lunch. Always good Gove Pamela a raise!!! Love this place. Food is always good. Best Lobster salad in the city. Chicken pot pie on cold day is perfect. Lovely wines. Service fantastic and everyone makes you feel welcome. Love the Grill on the Alley! Outstanding service and food always great. Old school Beverly Hills classic not to be missed.